As many people organise Middlesbrough hog roast social gatherings for a birthday or a wedding reception, the number of people which attend these can differ. Whether it’s for only a handful of people, a few hundred or even several thousand catering might need to be provided. If this is a situation which you find yourself in, we are able to help. 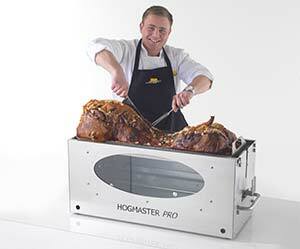 Our hog roast machines enable for meats of all types to be cooked in such a way which tastes absolutely wonderful. Our hog machines can also cook other meats than hog which include lamb, beef as well as a vegetarian option which can be tofu. Many of our customers in Middlesbrough have commented about how they have never tasted meat like this before especially when they accompany their meat choice with apple sauce and a selection of mustard. You might be wondering right now about how much we charge for our services? Our pricing comes under three different options. Our first allows for you to simply sit back and enjoy yourself. This pricing band means that both our machine and meat is supplied. What we prefer to do when our customers choose this option is arrive the day before your social occasion is to take place so we demonstrate to you about how our machine works. It also enables for us to show you about the best way for your meat to be cooked so you can enjoy even greater meat. The second price band allows for our customers to choose the meat of their dreams for they provide the meat with our services consisting of supplying the machine only. This convenient option has allowed for our customers to try the meat of their choice which they might not have tasted before. It has been known for these customers to hire many of our machines so they can sample all types of meat at the same social occasion. There is a third price band which we can offer our customers in Hartlepool as well. 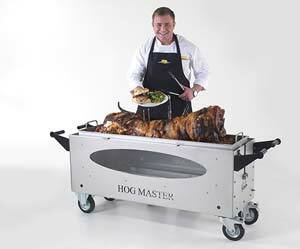 Delivering the hog roast machine in a box, the machine can then be assembled through easy to follow steps. This means that the machine can be constructed at your convenience. Customers who choose this option will need to provide their own gas canister. All of our hog roast machines can be returned to us clean or dirty although we do charge an increased rate if it is returned unclean. With all of our machines, they can be hired for as long as a customer wants. Whether it’s for a couple of days, weeks or even several months our machines can be hired for as long as possible. Customers who choose to have their machine for longer periods can be charged a reduced rate. Furthermore, if you enjoy your hog roast machine, we also offer you the chance to buy the machine. This then allows for you to host as many hog roast catering social occasions as you want and can be supplied to you at a price which can fit into your budget. Durham can be found in the North East of England. It has a cathedral which has been designated as a UNESCO World Heritage Site and Durham also has many picturesque locations. As well as this, the residents of Durham can also benefit from receiving our Redcar hog roast hire services as we have provided assistance all around this wonderful city. For all functions involving the hog roast machine hire Darlington, choosing to hire our hog roast machines can provide you with a wonderful experience as well as food being cooked to perfection which tastes absolutely wonderful. Many of our customers have remarked about how much they were impressed with the food which they received as well as the assistance which we provided for them. Although some of our customers in Stockton have hired our machines before and they know how to operate their machine, some do not but thanks to our dedicated, customer focused team they can assist you in having the best social event possible. Our prices are unbelievably reasonable which can suit all types of budgets. If you require further information, please contact us today so we can inform you about the many benefits of choosing our machines. We can guarantee that customer satisfaction with our hog machines will always be at a high so do not delay in contacting us sooner rather than later. Yarm hog roast machine hire; offering you the best way possible to enjoy your social occasion in Middlesbrough no matter what the weather brings. Aldbrough St John, Barrow upon Humber, Bishop Burton, Beamish, Birtley, Blackhall Colliery, Boldron, Bowburn, Bowes, Burnhope, Burnopfield, Carrville, Castleside, Chilton, Cornsay Colliery, Cotherstone, Cowshill, Coxhoe, Croft on Tees, Croxdale, Eaglescliffe, Ebchester, Edmondsley, Esh, Ferryhill, Fir Tree, Forest-in-Teesdale, Frosterley, Haswell, Hunwick, Ireshopeburn, Langley Moor, Langley Park, Lartington, Low Pittington, Piercebridge, Romaldkirk, Rushyford, Sacriston, Seaton, Seaton Carew, Shincliffe, Shotley Bridge, Shotton Colliery, St Johns Chapel, Stanhope, Thornley, Tow Law, Trimdon, Ushaw Moor, Walworth, Weardale, Wearhead, West Auckland, Wheatley, Witton Gilbert, Wolsingham.